Five hundred Grade 12 pupils from across the Eastern and Southern Cape have devoted the last week of their holiday to improving their accounting marks at Nelson Mandela Metropolitan University’s accounting winter school. Run by NMMU’s School of Accounting, the week-long programme which began on Monday provides an intense crash course covering the main components of the Grade 12 accounting curriculum. The programme is taught using the School of Accounting’s teaching model – which includes a combination of lectures, homework and tutorial classes. NMMU Accounting 1 lecturer and winter school coordinator Ansulene Prinsloo said: “We are aiming to improve the participants’ Grade 12 accounting marks, and thereby increase their Admission Points Scores (APS). This will improve their chances of getting into university in the degree/diploma of their choice and obtaining funding for their studies. The winter school is sponsored by Deloitte – with Deloitte regional leader (Eastern Cape) Stuart Wedderburn and four other Deloitte staff members playing an active role as tutors alongside 16 top Accounting students. In addition to providing funding to cover the operating costs of the winter school, Deloitte donated files for every attendee, as well as 60 lucky draw prizes. There are also prizes for the top three participants as well as the most improved pupil. These include a Samsung Galaxy Tablet and gift vouchers worth R1000, R500 and R350. An information session precedes each day’s lectures, where the pupils learn about bursaries and study options, or listen to motivational speakers. One of these was Chartered Accountant Ncumisa Saba, who grew up in Idutywa, completed her articles at Deloitte and is now working as a general accounting co-ordinator at General Motors SA. “I’m just a village girl – don’t let the high heels fool you,” said Saba, hoping to encourage the pupils that “anything is possible”. “It’s good preparation for varsity,” said Westering High’s Yusuf Abrahams, 18. Pupils have come from as far afield as Mossel Bay and Queenstown. 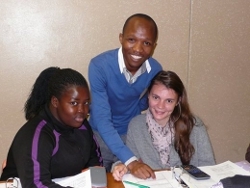 One of the tutors, Deloitte trainee clerk Sitembele James, raised funds for nine pupils to attend from Nyameko High School in Mdantsane near East London, where he runs an upliftment programme for pupils. This is the second accounting winter school run by NMMU’s School of Accounting, which will also be hosting a shorter accounting spring school for Grade 11 pupils in September this year. It is planned that next year’s winter school for matrics will run for a fortnight, and cover both accounting and maths.